I never know what kind of stuff I'm going to find as I go through the Jack Gordon files. In a folder from the Restaurant Association for 1969, marked "Personal" came this clipping. It was marked that it came from the March 21, 1969 issue of the Catholic Progress. It's no surprise that Jack was able to line up the two college hoopsters from SU as he had been connected with the SU Athletic Department since 1946 and announced their home games at the Seattle Center Coliseum. 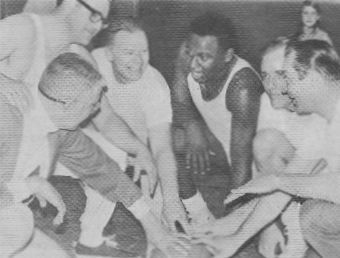 Only six weeks after the game below Jack was honored as the SU Distinguished Alumni for 1969. Even aided by two willing "ringers" from Seattle University's basketball Chieftains, the St. Edward's Seminary Parents Club basketball team dropped a squeaker to the quintet made up of Sulpician priests on the faculty, 60-59. Lou West and Michael O'Brien were the SU dribblers who went to the aid of the parents. The game was a highlight of a series of events held at the Parents' Day at the seminary last Sunday. An entertainment, staring [sic] the students, was also a feature of the fun-packed afternoon. Shown getting ready for the first tap-off, above, are some of the Parents' squad. From left, John Ruhl, Mike O'Brien, Lou West, John Baumgartner. Don Thor and James Maye.